So this season's race, I'm pushing for letting the kids stage their own cars. I think this could be really good, but it also introduces another potential chaos factor, as boys are, well, boys, and we don't want things to go wrong. I also want to keep things as efficient as possible, so as not to exceed our Derby's time budget. So, here are the steps I plan to take for the race. Please let me know what you think of these. - GPRM "Master" Scheduling: Boys get antsy when they go too long without something to do. I am hoping that the Master Scheduling option with GPRM will help keep them more engaged and focused (and less prone to mischief). - Staging platform: One of the Pack dads built us a beautiful staging platform that can double as an award ceremony stand. - Name/Number badges: After getting all of the racers and cars checked into GPRM, I plan to make name badges that have the car numbers on them, so that it will be easy to tell at-a-glance who owns which car. -- Tablemaster: The tablemaster is responsible for removing cars from the impound area and giving them to their owners for staging. He or she is also responsible for replacing the cars after they've run. -- Wranglers: The Wrangler is responsible for assembling the groups of scouts for the racing groups. When the next 'on deck' group is announced, the Wrangler will call out the named Scouts and bring them to a specific 'on deck' area to stand and await staging for the next round. We'll need two of these. -- Staging Supervisor: Responsible for assisting Scouts in staging cars, double checking staging and staging for anybody unable to self-stage. We set GPRM to display the "on deck" group for each race. The emcee will call out this information as part of the heat announcement. Wrangler #1 will go over to the seating area for the boys and grab the on-deck group and bring them over to the designated on-deck area. 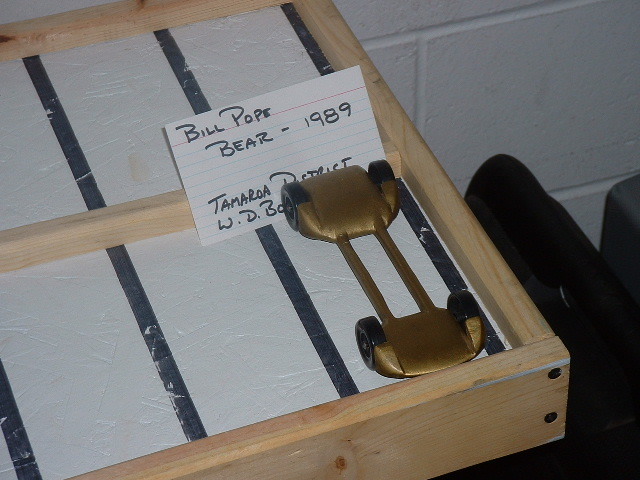 Once the track is ready for staging, Wrangler #1 takes them to the impound table where they (one by one) show their badges to the Tablemaster, who gives them their cars. Wrangler #1 escorts the group to the track, where they, one-by-one, in sequential order, ascend the platform and, under the guidance of the Staging Supervisor, place their cars on the track. Wrangler #1 escorts the Scouts to a space at the end of the track, and the heat is run. The scouts retrieve their cars and bring them back to the Tablemaster, who replaces them. run, Wrangler #2 begins the process of having the next set of racers collect their cars and move to the staging area. Thoughts? What am I overlooking? Help me think through the worst-case scenarios here. It sounds almost Perfect to me. Design it so NO ONE except the scout ever touches his car after inspection. If he drops it or mis-handles it, it's his fault. In my 30 years of being in charge, we have never had an accident involving anyone other than the scout. Best of Luck. As the On Deck listing is not always visible on the Racing screen (when showing the heat winner), I recommend printing out the schedule and go off of that. If your group size is such that a boy is racing with only 1 or 2 intervening heats, then I would have them hold their cars between heats rather than returning them to the impound. If there are 4 or more intervening heats, then I would probably have the cars move from the impound to race its heat and back to the impound at the end of the heat. Suggest that the boys be called to stage starting nearest the starter. Suggest to the boys that after they stage their car they watch their car while others are staging to catch if it is touched by another. If the driver thinks that it has been touched, then the starter should allow him to return to the staging platform and check visually, then, if necessary, adjust the car. If the starter thinks that a car has been touched, he should call the driver back to check and, if necessary, adjust the car. During such callbacks, a second starter should watch from the other side of the track from the primary starter. I recommend against anyone other than the owner/driver handling his car except at the request of the owner/driver. gpraceman wrote: As the On Deck listing is not always visible on the Racing screen (when showing the heat winner), I recommend printing out the schedule and go off of that. Thanks for the suggestion, Randy. That makes good sense. Though, unless I have a printer onhand at the race, I won't be able to do that for finals or tie-breaker rounds. stan pope wrote: If your group size is such that a boy is racing with only 1 or 2 intervening heats, then I would have them hold their cars between heats rather than returning them to the impound. If there are 4 or more intervening heats, then I would probably have the cars move from the impound to race its heat and back to the impound at the end of the heat. My understanding is that with the Master scheduling option, the heats from the different ranks will be interspersed, so it isn't likely there will be a lot of back-to-backs. speedster wrote: Design it so NO ONE except the scout ever touches his car after inspection. If he drops it or mis-handles it, it's his fault. In my 30 years of being in charge, we have never had an accident involving anyone other than the scout. stan pope wrote: I recommend against anyone other than the owner/driver handling his car except at the request of the owner/driver. The only people who touch the car are the Scout and the Tablemaster, the latter of whom is responsible for keeping all of the cars in their sorted spots on the table. Nobody else should have reason to touch the car, unless somebody specifically requests that the Stager stages their car. Just be sure to have a spotter to make sure the cars are on the track properly as well as make sure none of the boys fall off the platform. My kid is pretty short and still barely reached with the platform they used at districts and set his car off the track a few times. They were good about catching it though and asking him to come back to fix it. The only people who touch the car are the Scout and the Tablemaster, the latter of whom is responsible for keeping all of the cars in their sorted spots on the table. That is one too many! The Tablemaster could function as well by pointing to the place that the Scout should place his car. A common problem encountered is that the table is too high and too deep for many of the scouts to reach across safely. We solved that problem with some simple Scout-height narrow tables with marked parking spots! Less than 8 ft long, 2+ car lengths wide, and about 18" tall, with raised center and edges. The parking spaces are 3" wide and separated by a 1/2" mark, so not crowded. Each table holds up to 50 cars. Legs fold in via simple "hinges" made from short pvc pipe sections in drilled holes. If spectators can reach the cars on the table put a sign to not touch unless permitted by owner. Our district race was held at a mall and i cringed seeing a passerby picking up all the cars. Some parents and other scouts can be a little handsy as well even when just setting their car in the impound. ngyoung wrote: If spectators can reach the cars on the table put a sign to not touch unless permitted by owner. Our district race was held at a mall and i cringed seeing a passerby picking up all the cars. Some parents and other scouts can be a little handsy as well even when just setting their car in the impound. Oh, goodness, no. Regardless of whether or not it is Scouts-touch-only, or Scouts and Tablemaster, there WILL be somebody patrolling the table and warning off any grabby hands. I also hope to recruit some of our Boy Scout Den Chiefs to help patrol both the track and the cars. We really like having the Cub Scouts staging their own cars at the Pack and District races - it gives that extra "sense of ownership" that they're racing the car, not some official. It does mean they could drop the car, but it doesn't happen often at all, and there's no claim that the official did anything nefarious. And even with the boys staging their own cars on a 4-lane track, and our announcer (typically a Boy Scout) interviewing the boy in Lane 1 and asking questions about the car, we can still turn in heat cycle times of 50-55 seconds. Overall, I think our first attempt at having a Scout-staged race went pretty well. I think the boys really enjoyed it. One parent even told me that his son had deemed it the best derby ever. - I had built a 'staging box' to put cars into ahead of the next heat. Turns out that 2 or 3 of these would have been better, as they would have let the staging crew get cars ready, faster. - I did notice some adult stagers 'fixing' cars that kids put on the tracks. Next time, I'll explain that the staging is part of the game, and that kids' cars should be left as staged, unless clearly wrong (e.g. wheel hanging off track). - By the time we got to the finals, it was asked that we move to adult staging due to time constraints. I didn't prefer this, but not everybody wants to be there as long as I do. Next time I'll endeavor to run a tighter race and maybe we'll be able to do kid staging for the entire event. - Sometimes, kids would forget to pick up their cars from the end of the track. Occasionally, I'd see a scout just grab an ownerless car, along with his own to bring back to the staging table. I sort of cringed at this, but thankfully nothing got dropped. Next time I'll emphasize the 'only the staging team or the owner will touch any given car' rule.